After completing a purchase, the customer needs an order confirmation email ASAP. Most people expect this email to come through within minutes. Here’s an example from outdoor gear outlet Huckberry: Starting out with a prominent “Thanks”, this email confirms all the basic information about the order. Extra details, like a delivery window, and setting up expectations for the shipping confirmation to follow, are a nice touch to the whole Huckberry purchase experience. The confirmation email is your opportunity to provide your customer with personal confidence about the transaction that just occurred — and build a nugget of trust in your brand. That all relies on the email coming through, right after purchase. Your password reset email also needs to go out immediately. Otherwise, your customers can’t log in right when they want to. Forgetting a password is already annoying and disruptive, and any delay in getting back on track will increase a customer’s frustration. For the business, this event is make-or-break in terms of losing meaningful engagement and trust in your product. Plus, forgetting passwords happens often (the average customer has 37 password reset emails in their inbox at any time, according to research from Dashlane). It’s one of the most important transactional emails people receive as well as the most straightforward. Send immediately with a simple, clear call to action. 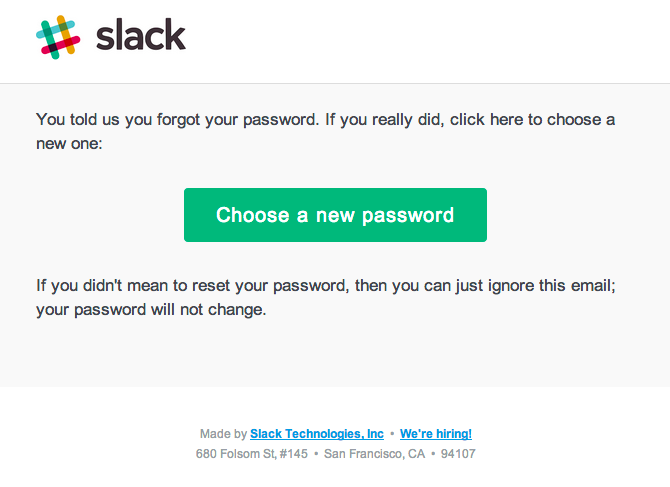 Here’s a great password reset email example from Slack — it’s branded and arrives immediately upon requesting a reset: You can send these emails in Customer.io by setting up an Event Triggered Campaign to send out a single message that’s triggered upon a reset request by the user. First, let’s talk about payment platforms. According to Churnbuster, many payments providers have automatic card updates, which are “already effective for over 70% of cards that look like they’re going to expire.” Also the timing of automatic retries can vary depending on your setup — you might specify the rules or use features like Stripe’s Smart Retries. Why does all that matter? These details can determine whether you should send pre-dunning emails at all, or what the timing of your follow-up messages should be after an unsuccessful charge. (Consider all your possibilities before you send transactional emails.) Here at Customer.io, we use Stripe as our payment platform and it’s connected with our Customer.io account. Since Stripe automatically updates outdated cards, we don’t send pre-dunning emails. 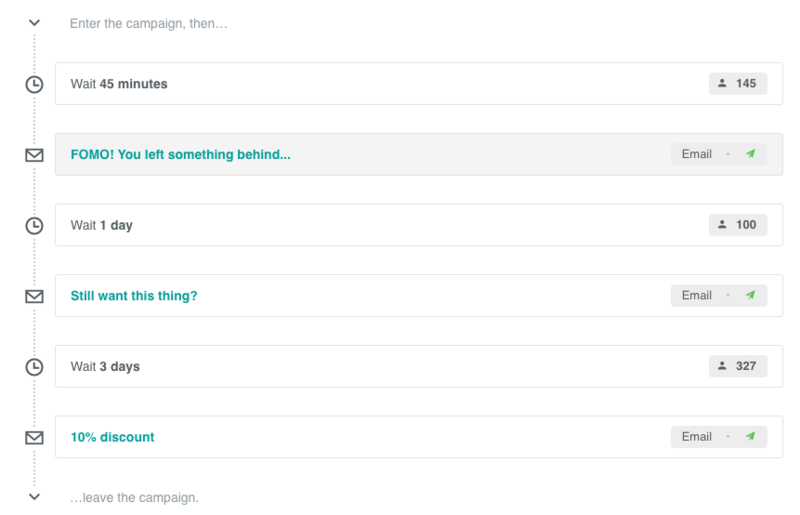 And the timing of post-dunning emails can vary depending on Stripe’s smart retry schedule. We created a workflow in which a customer may get up to 4 messages about their failed payment, with the last message providing a warning about account cancellation if the customer doesn’t take action. Pre-dunning 1: Customer enters the delinquency segment with one month until expiry and triggers email. Dunning: The third email will arrive on the day of expiry or charge failure. Post-dunning: A final email is sent a few days after expiry or charge failure (with a warning that the customer’s account will be deactivated due to credit card failure). 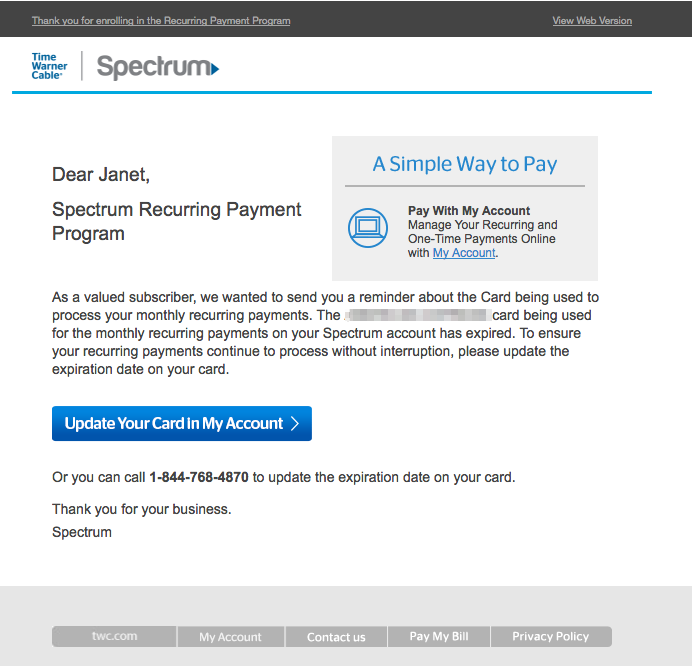 Here’s that last dunning email, which urges me to update the expiration date on my card so I keep getting internet service. If nonpayment means that you’re going to delete or block access to an account, it’s helpful to provide a window for when that will happen. 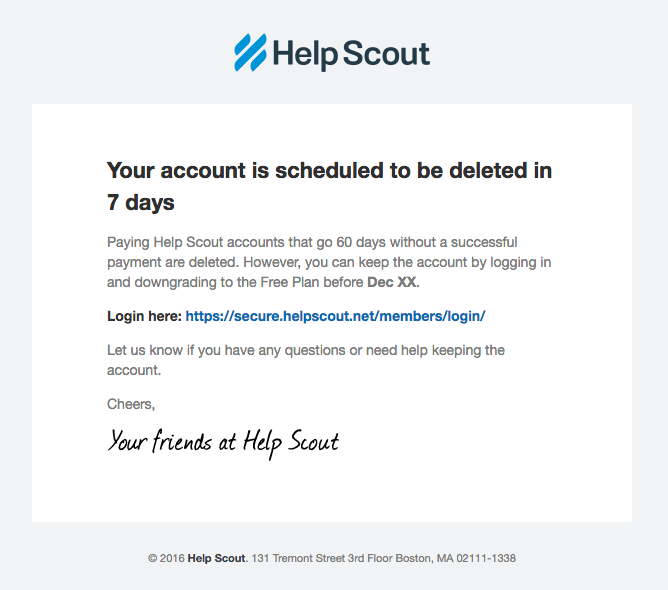 Take this example from Help Scout, which is sent seven days before an account is deleted for nonpayment, with directions on how to keep the account open. 1st email: Sent within a few hours of the customer abandoning an item in their cart. This message reminds the customer of your product while they’re still potentially in the buying mood. 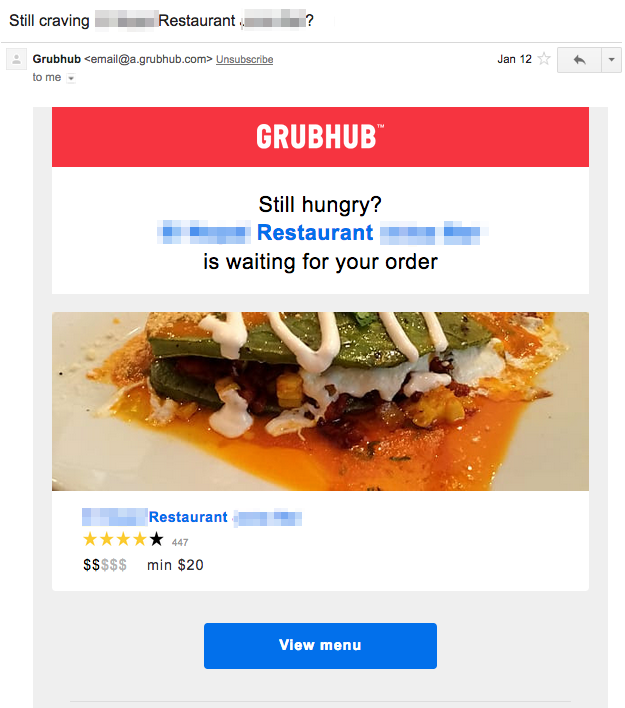 2nd email: Sent within 24 hours of cart abandonment, giving customers a night to sleep on the decision. 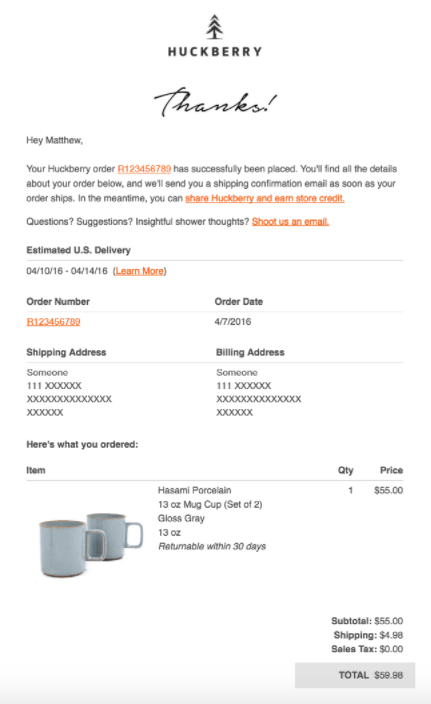 3rd email: Sent within seven days of cart abandonment. 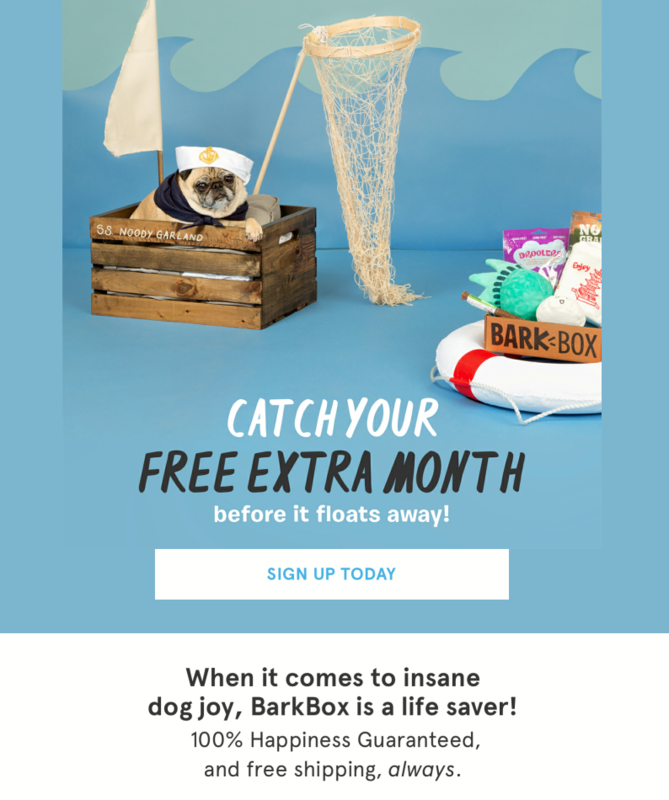 This is your last ditch effort to entice the customer back to their shopping cart and can be an opportunity for offering a discount as an incentive. When Do You Send Transactional Emails? Your transactional email timing works best when you know the purpose of each message and how your emails get triggered from what data. Let us know what works for you in the comments!